Technology sure has grown since the start of this industry. 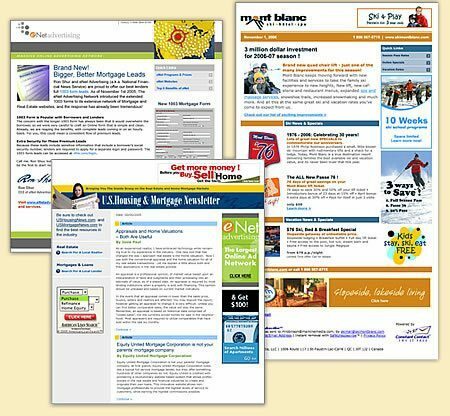 In the 90s, we were doing everything with paper and pen.Paper schedules, our flip phones, if we even had that… and websites were just coming on the scene. Social Media wasn’t popular and the only real type of marketing and advertising was good old fashioned print mail. Take a minute and think about this for a second. If you started a business in the 90s or even earlier 2000s, the way we get business and provide business has 100% changed since then. Some might argue that it has gotten more complicated since then, but technology has actually made it so much easier to get instant data coming in and going out of your business that you can make real-time decisions. We can make pivots without waiting for publication cycles or a meeting with a bookkeeper. Automation is something that many businesses need to adopt to make their processes run smoother. 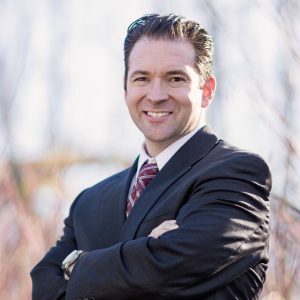 Proper automation could actually yield higher profit margins, while improper automation, or lack thereof, could really add to the stress of owning and operating a business and cost the business owner a lot of money. 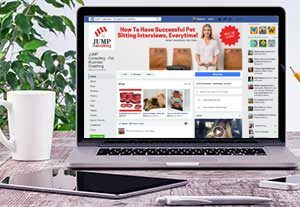 Today, I am going to show you all the ways you can automate a pet sitting and dog walking business. Listen up! If you are a solo sitter, this is especially important because there is only one of you and you need to make every minute of your day efficient. If you are in the process of building and scaling your business, it is even more important. You want to make sure you have as much automated as possible so when you hand the baton to an office manager they will have the most efficient workflow. 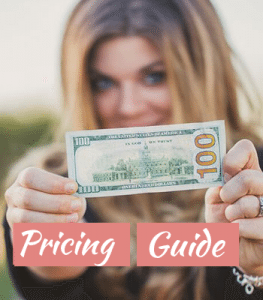 So here is the list, in no particular order, and how you can use it in your business. GSuite has so many advantages that your business can be using. First, is the email. Here, you can assign everyone their own email so that all the company info is sent to that email and when they leave the company it is all absorbed back to your company. If you do not do this, consider yourself to have a security breach where clients sensitive info is stored forever on someone’s email account. Another advantage to GSuite is the ability to have canned responses. These are responses that you or your staff might type all the time, but being able to populate the message inside the email with one button really saves a lot of time. It also ensures that the messaging from your company is consistent. A. Email them back and break the boundaries of office hours essentially showing them that they can reach you at all hours of the night. B. Try to remember to reply to them in the morning and sleep with one eye open because you don’t want to forget. You know that feeling? Like something is hanging over your head? This might sound like a no-brainer but do you even know how many pet sitters and dog walkers are not using this the right way? Make it mandatory that every client needs to schedule online. They need to update their notes online. They need to change their schedule or cancel….. make them do it all online! Make sure that your entire staff if using your software to the fullest capabilities. You can even turn on notifications for GPS in case some don’t arrive or check in at the right time and this has been a lifesaver and peace of mind to so many. 4. Mobile version or app? More explanation about how to come to a decision on this here. This goes hand in hand with software. Whenever anyone has a question about the software (clients or staff), record a short video explanation. 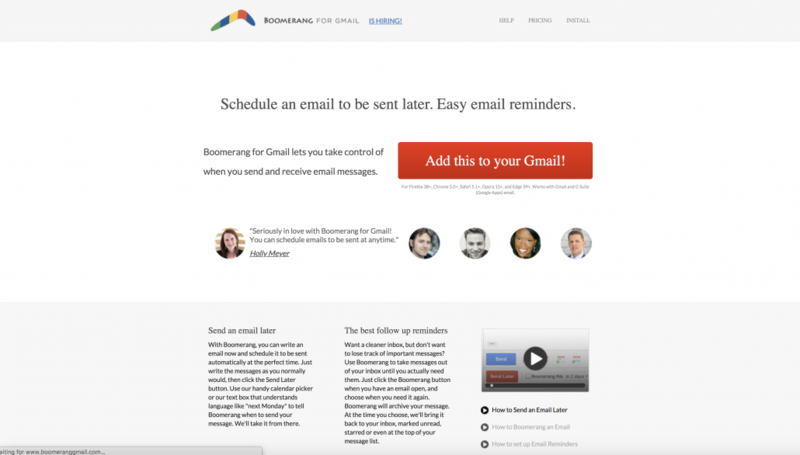 Loom is a free Chrome extension where you can record your screen. By doing these videos, and then properly naming them and storing them, this will allow your staff and clients the ability to make a difficult situation easier by way of the video. You could even create a video and add it to your FAQ on your website so it is at the user’s fingertips. This will also decrease the number of problems you have to solve. Ever struggle to know what software to schedule your social media? Agora Pulse really checks ALL the boxes. They post to every relevant platform, have a way for you to keep up on your social media notifications and inbox all in one place, and also will recycle your content so it never “dies” after you post it the first time. 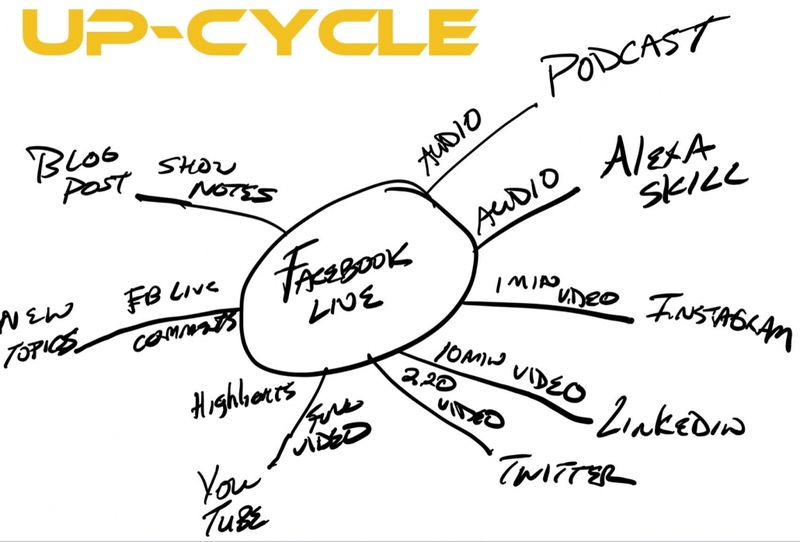 This is a necessity for any small business who wants to have a killer social presence. If you’re ready to get started, you can sign up right here for a free trial and 2 months free! 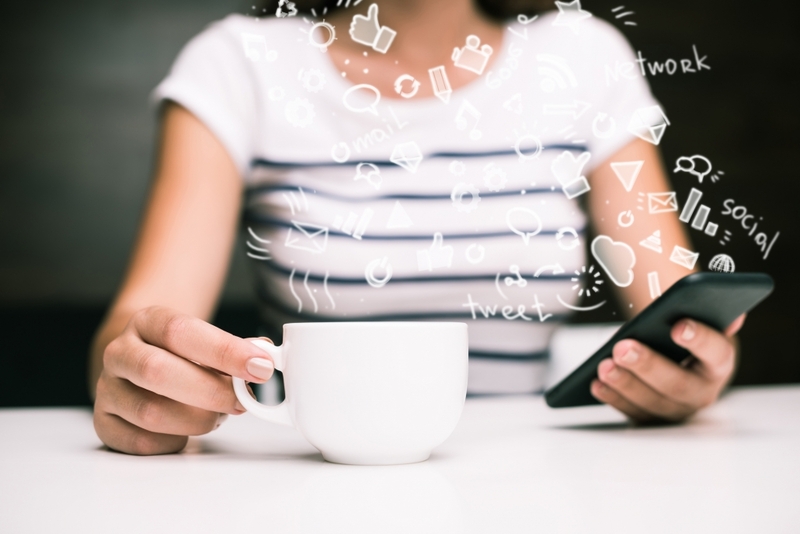 If you get into the habit of batching your social media, you can do it all in 1-2 hours a month to set it and forget it. then you will be getting told that “I see you everywhere” when it really took minimal effort! My staff knew what days they needed to email me their payroll by. I would gather all the names and amounts and email it to my specialist. Done! The company took care of the rest and direct deposited it all. Having a company take care of all the necessary payroll “stuff” is very helpful. Percentage change and laws change and honestly, there is just too much to keep up with. Certain forms need to be filed at certain times and when you can hand it off to someone to take care of, it will free up a lot of your time and headspace. Did you know studies show that if you don’t see it, you will spend more money? It always makes me chuckle when people think credit cards COST money because they see it coming out but don’t realize that the mere fact of having credit cards will cause people to spend more with you… because they don’t see it! It happens all the time. If you have a software system you can automatically set it to charge clients at a certain time or you can go in once a week and click, click, click, CHARGE…. and off it goes to your bank. Using credit cards saves SO much time over collecting the checks and going to the bank. You won’t ever have to sit down and search through Paypal to see if someone paid you, be folding laundry to find that you WASHED the check that was in your jeans, or just try to keep track of the cash you have been given. Sure, credit cards cost (typically less than 3%) but the time that you save and money made by not seeing it is astronomical. Guess what? I have people that do this too. Email me if you want the hook-up! Most hiring methods are de-funked and I get it. You have a lot of other things going on and when an applicant gets back to you it isn’t always easy to stop what you are doing and reply. Let alone understand what to say or remember which applicant you said what to. It is difficult when you need an employee you have to post a job opening, then wonder if your hiring ad is good enough, and then find out if anyone applies… etc. What if I told you over 70 pet sitters found the solution to that through automation and are using software to solve this problem? Did you know the job market is shifting? Do you realize that people aren’t just applying to your job? Do you realize it is like dating and you have to appear attractive to them? What better way to do that then responding fast and having an entirely automated process? A company I work with (and sponsoring the retreat!) 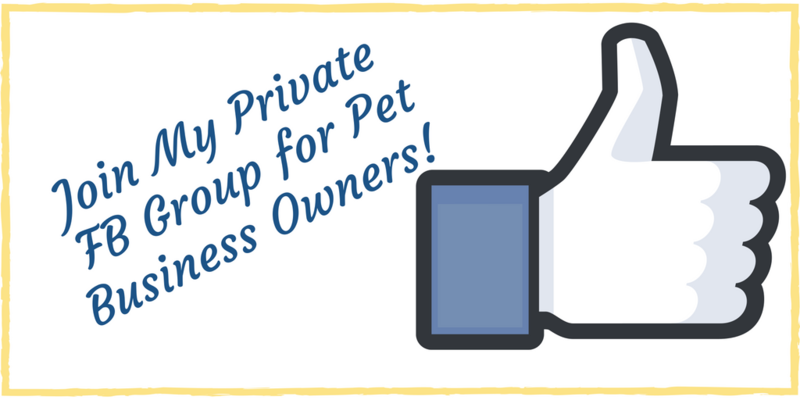 has done just that for over 70 pet sitting companies. I explain how here and you can get your own Bella hook up and discount here. Most people I know have a bookkeeper because they understand that there are just too many chances to make mistakes that will take money out of your pocket at the end of the year. 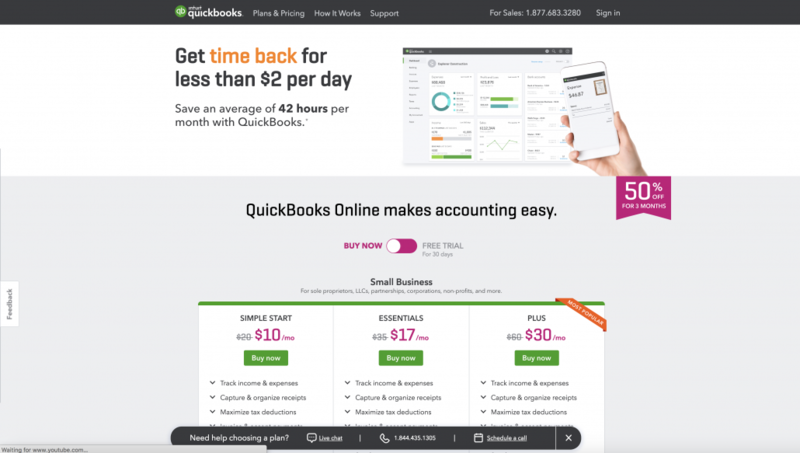 In order to get fast reporting, Quickbooks online is a must. Now, feel how you may about the company… but once it is set up the rest is really easy. AND if you have a bookkeeper this is something they can do for you. Having a bookkeeper and QBO allows you to get reporting fast because you don’t have to pass reports back and forth. It also allows your statements to be downloaded automatically from your bank and credit cards. I highly recommend this set up. It is what I do and I only have to look at my numbers when my bookkeeper sends me her monthly report and I have full knowledge of what I am spending money on, profit, cash flow, and what I can afford. Like Asana or Trello are great project management tools or even a great place to store a checklist with your Standard Operating Procedures (SOP). Here, your office staff (or you) can do a brain dump and organize the cards into categories that make sense to you. You can add people to the boards and you can share your thoughts and plans in an easy way. If you don’t check this weekly, you are missing out. It will tell you how people arrive on your website, where they go, what they read, and even what you need to add to your website. 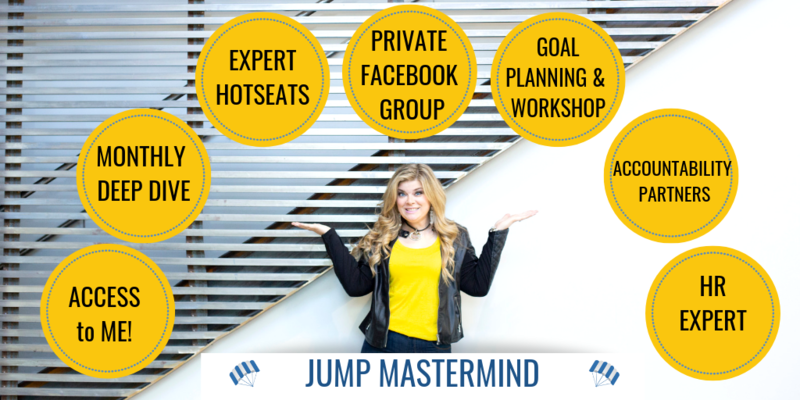 This is a highly powerful tool and we actually have a lot of trainings on it in the Jump Mastermind. 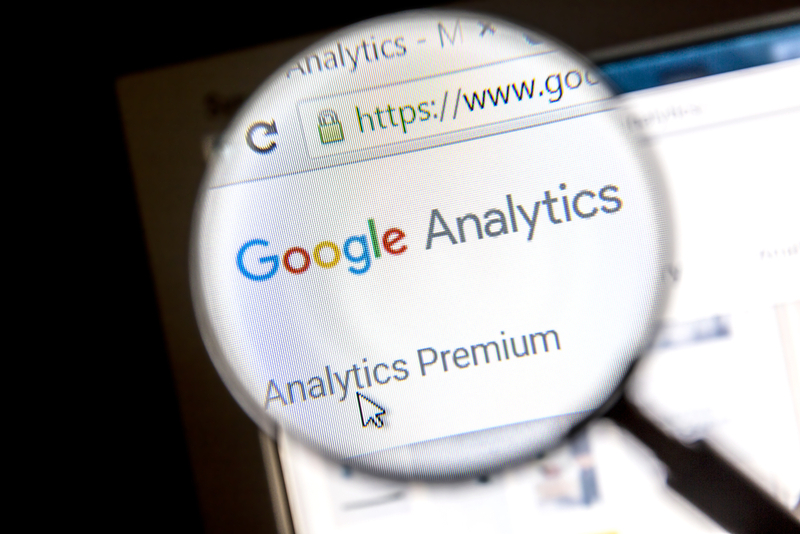 Plus, Google Analytics is free! If you need help in any way, let me know in the comments below or in one of my free groups. I am here to help. One of my clients called me frantically last week. Two of her dog walkers quit on the same day. She was freaking out. It was going to cause her to get back into the field and she knew that she wouldn’t have as much time to work on her business. Ever feel like that before? You get caught in the conundrum of feeling like you don’t have enough business to hire, yet if you don’t, you feel like you are living on the edge. 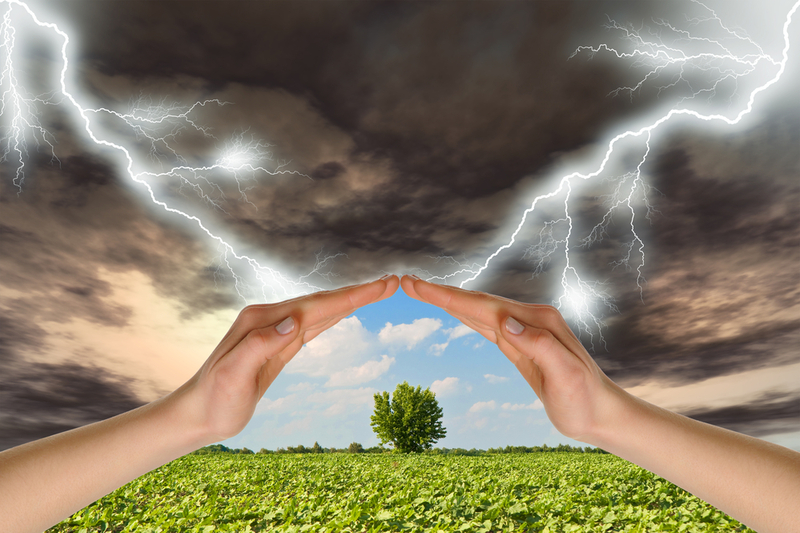 You know that if the perfect storm comes (and enough people leave the company at the same time) you will be back in the field just like my client above. Today, I am going to help show you how to never be in this position. How to stop that conundrum and take control over your business so you aren’t living in slavery to your business at the drop of a hat (or a resignation letter). There is a major shift happening with hiring pet sitters; It is the difference between being reactionary versus responsive. The ones who are acting responsively are scaling their companies at record times. Reactionary Hiring Happens Only When You Have To Hire. 1. Just had someone quit. 2. 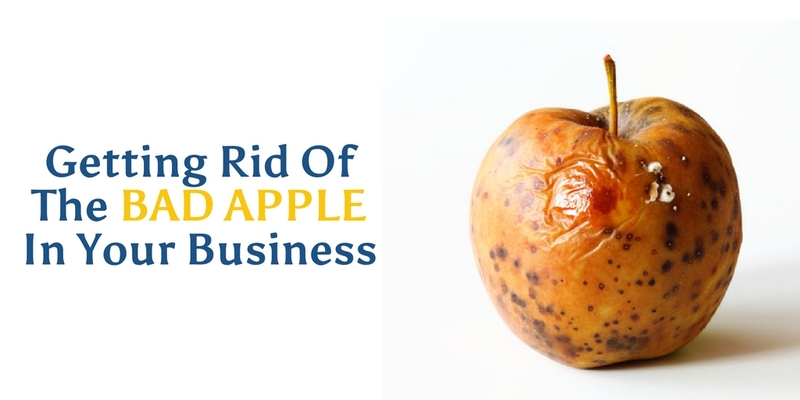 Want to hire someone to replace a bad apple. 3. You have so much work that you need more help. This is hiring for a specific reason. You are only trying to fill the funnel when you have a need . . . which makes you already behind the eight ball. When you are constantly behind the eight ball, it can lead to a lot of stress in your life. You don’t get to consistently work through projects because you have to keep stopping to jump in and help get walks and visits covered. And don’t even think about your social life! You are the friend or family member who is always rushing off, never there, or too tired to attend. And, you know what? You just can’t last longterm living like this. Responsive hiring is when you’re constantly looking for great people to bring on your team. You are always feeding the funnel by keeping your hiring ads fresh. You are constantly sifting through all the applicants and putting them into warm & hot categories. How you organize this or keep track of these applicants is hugely important. You want to have a system that can track it all, sort it all, and not distract you in the middle of your regular working day. You don’t want to lose sight of all the good applicants out there- even if you don’t want to hire them today. You don’t know what tomorrow holds. The important part is being able to recall all of the qualified applicants right when you need to and have the right type of software can help you with just that. Are You Able To Email A Pool of Qualified Applicants Today? Right now, are you able to email a pool of applicants that have already passed the first or second round of vetting for your company? Are you able to ask them on a “date” (interview) and get them up and hired in the next week? If the answer is no . . . and you have to start from scratch by posting an ad . . . then you are reactionary hiring. This causes a lot of sleepless nights. Feeling of helplessness when your office manager is telling you . . . “I am posting all the time but not getting any applicants”. It is like the weight of the world is on your shoulders and you are about to collapse! This is exactly why I say to “always be hiring” and “hire more than you need,” because you just never know! I have been there personally with my former company. I have had the pit in my stomach, the worry, and as a coach I have been dreaming and searching for something I could pass along to you to help take all that fear and anxiety away. I have seen vacations be ruined because the business owner had to stay back and take care of the business because they were understaffed. I have also seen business owners look forward to a dream vacation, spend a fortune, count down the days, only to spend the entire time working and putting out fires. This is not why we started our own business and we must keep that in sight. Getting ahead of the hiring challenge will help you to grow a business that you desire. It will help take you from solopreuner who really just has a job to someone who is the boss in charge that can multiply themselves for the masses. To grow, to achieve your goals, you have to get really good at putting yourself out of a job. But in order to do that – you must have someone to replace you. If you don’t figure out how to hire for your business you will eventually stall out. Don’t let this be you. I want you to think back to when you started this business. Why did you start it and at what point did it start running you? Staffing is 50% of the challenge that you will always have no matter if you are just starting or been around for 15+ years. You must stop trying to save the same problem again and again and start solving it systematically. Are you going to consider creating a process where you can have QUALIFIED applicants always on hand? 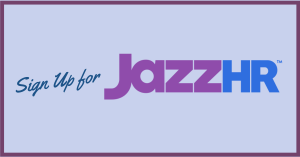 Over 70 pet sitting and dog walking companies have trusted my partner, JazzHr with their hiring needs and have been able to take charge of their business and their life because they now have control over the hiring challenge. Whatever you choose, know that this is something you will need to address so you can take some of the stress away from running a growing business. 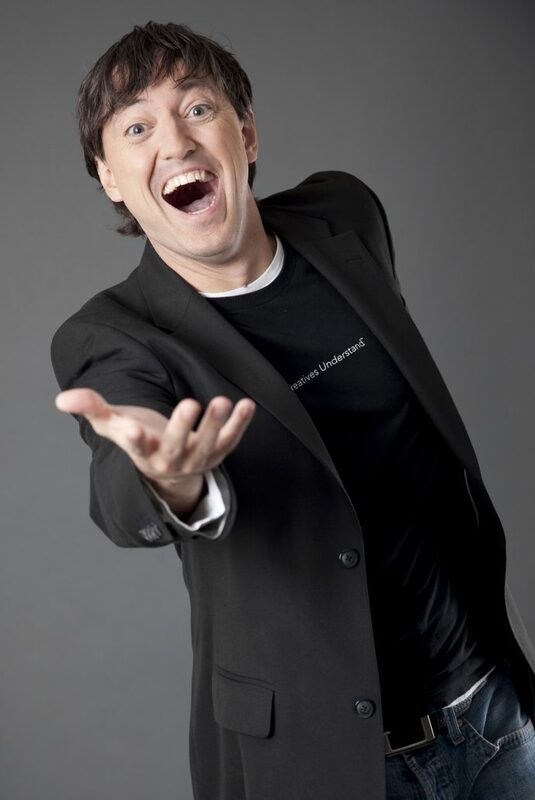 I am inviting you to attend my 3 part FREE webinar that will help you scale your business by attracting & hiring the right people for your business. This program is ideal if you have high turnover, feel hostage or you just don’t know where you are going wrong in the hiring process. In this episode of “Bella In Your Business”, Bella speaks with Britt Alwerud from Handlr. 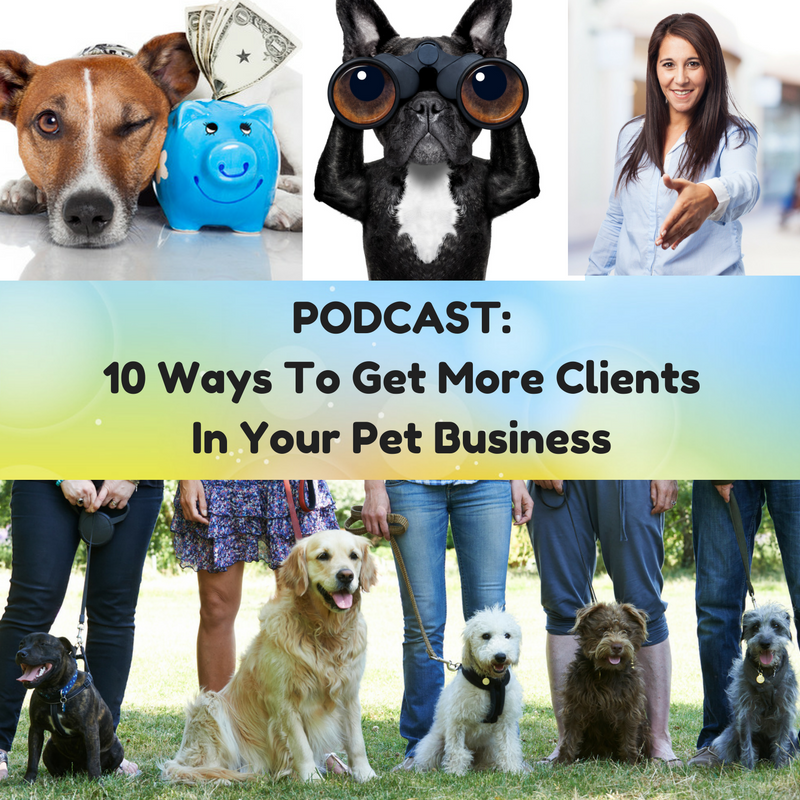 They discuss the top 9 apps they think are great for the Pet Sitting business. 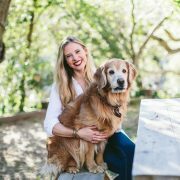 Britt Alwerud lives in Los Angeles, CA with her menagerie of furbabies – two Goldens, Daisy and Taj, two cats, Tiger and Monkey, two horses named Gracie and Moo, and a chameleon named Larry. Britt owns DogZenergy in San Diego, CA. 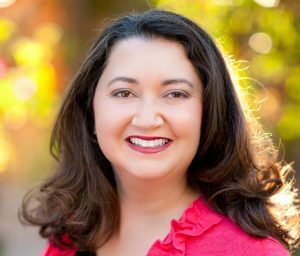 Now she’s the full-time Founder and CEO of Handlr. Handlr is the ultimate business app for busy pet sitters who are looking to automate and grow their business. Learn more about Handlr by clicking here or email her at britt@myhandlr.com. 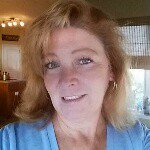 You can also find Britt on Instagram @doggonetechgirl or follow Handlr on Twitter @myhandlr for weekly business tips. In this episode, Bella talks to Britney Young. 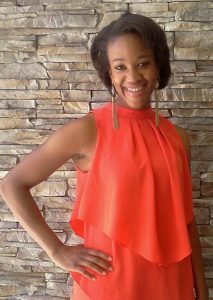 Britney is a digital marketing professional and social media enthusiast. 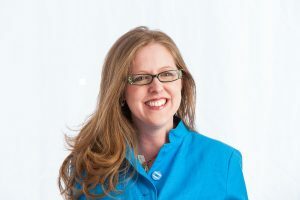 Her day-to-day life as a social media marketing manager includes: finding/curating relevant content to post to social channels, analyzing post data and post performance to see key trends or spikes in engagement, looking for relevant industry influencers to connect with, and responding to customer inquires, etc. The differences in the social media channels and a good workflow for pushing one post through many of them. Focusing your efforts on a few selected channels. 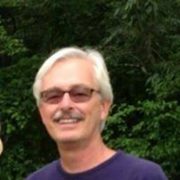 In this Episode Bella talks with Walt Galvin, an independent contractor working for Rover. 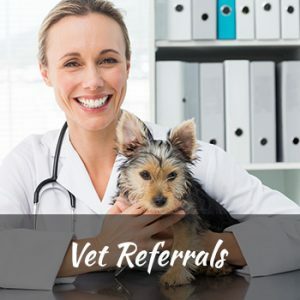 They discuss how sites like Rover can be a viable option for some pet sitters and walkers who are just starting out or want to keep it simple. Walt Galvin, independent contractor with Rover. 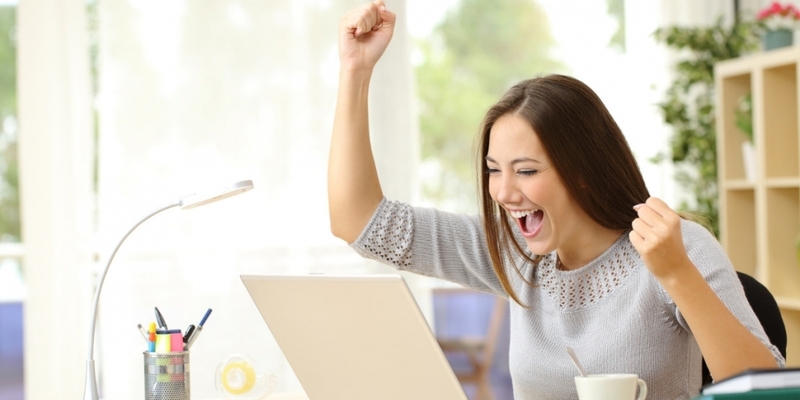 Not having to deal with all kinds of administrative headaches and paperwork. For Walt it has turned into a substantial retirement income and he points out that it is also a good option for those who don’t have the desire to hire other sitters and walkers as staff. Walt also recommends that you pay close attention to the service agreements, particularly in regards to what insurance covers and you may need to purchase additional insurance to cover yourself. Many of these online websites do not provide adequate coverage for the pet sitters. Only the clients. 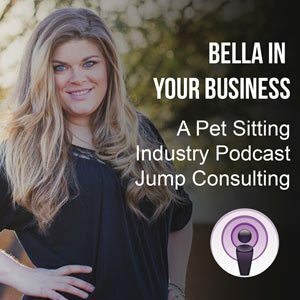 https://jumpconsulting.net/wp-content/uploads/2016/05/bella-pet-sitting-industry-podcast-album-cover.jpg 300 300 ChrisPodcast https://jumpconsulting.net/wp-content/uploads/2018/10/JUMP-CONSULTING-LOGO-2018-2-01-2.png ChrisPodcast2017-01-12 06:00:252018-06-06 13:15:03Episode 29: What Type of Pet Sitter is Best for Rover Type Websites? 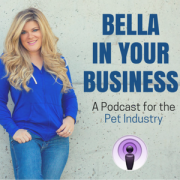 In this episode, Bella speaks with Jennifer Taylor, the Founder and owner of JenLovesPets, an award-winning San Diego pet sitting and dog walking company. 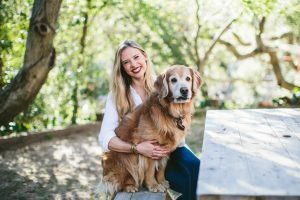 After sitting down with Jennifer in her home town of San Diego, Bella was so impressed with the vast knowledge and stories that Jen has that she immediately knew she had to be on a podcast with the intent to help elevate the pet industry when it comes to approaching and accepting clients who are aggressive or fearful. 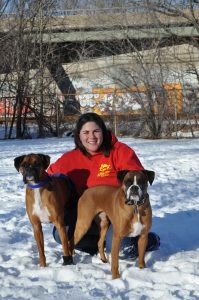 Bella and Jen talk about “aggressive” dogs and how people often lump fearful dogs into the same category. 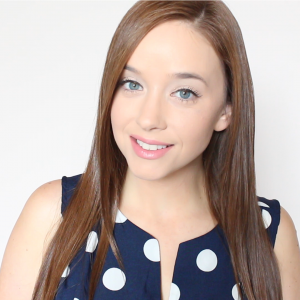 Jennifer discusses some of the causes of aggression and ways to overcome it. 1. What is the difference between fearful and aggressive dogs? 2. What advice would you have for a sitter who encounters a fearful or aggressive dog during a consultation? What steps should they take to ensure their safety? 3. What if that situation was that pet sitter’s staff member? How can one train their staff to acknowledge these types of pets and alert management? 5. 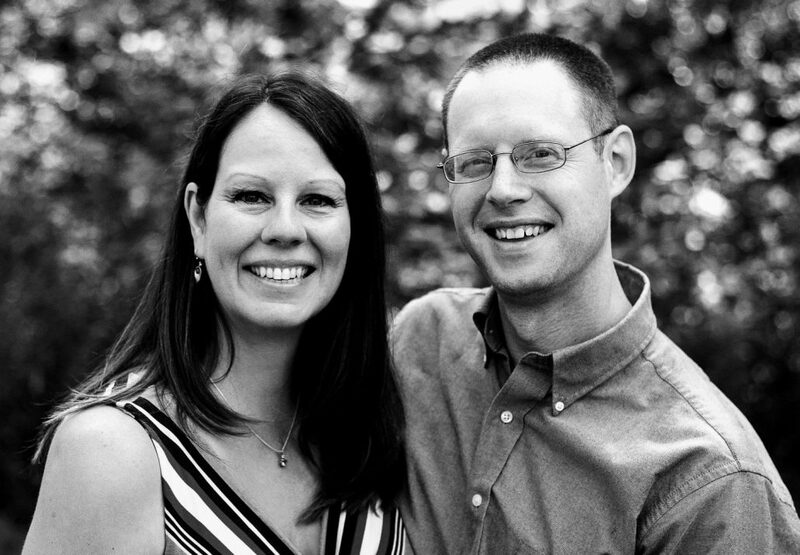 Where can sitters go to get more education on this topic for themselves and their staff? 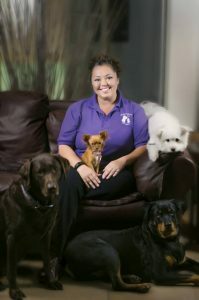 They also discuss how a pet sitter would go about working with a fearful dog by including dog behavioralists and trainers on the team. 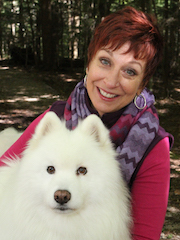 Jen also lists some great resources for those who want to work with fearful dogs. 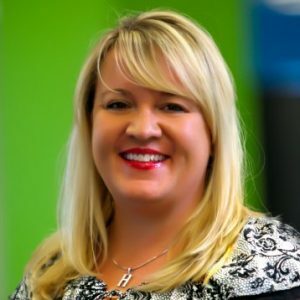 In this episode of “Bella In Your Business”, Bella speaks with Britt Alwerud from Handlr. 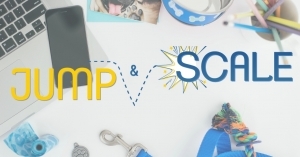 They discuss DogVacay, Rover, Wag, and Zingy versus Professional Small Business Owners. Why do you think so many small business owners are intimidated by the large powerhouses that have entered the market in the last few years? How have the changed the industry? 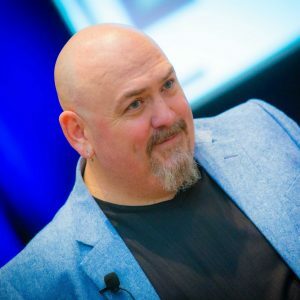 Are they really “disrupting” the industry? What are the pros and cons of the huge companies versus the more personal professional businesses? 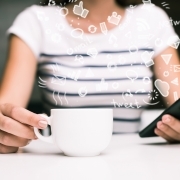 Are customers flocking to on-demand apps? Are they demanding an on-demand experience? 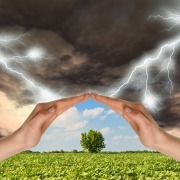 Are small business owners going to get screwed or what can they do to protect themselves? If someone is a Rover or DogVacay user, but they want to become a legitimate small business with people working for them, could they use Handlr? What are their first steps for becoming a legit business? According to Kristy, she is the only properly zoned boarding facility in Philadelphia that is operating out of a private home. 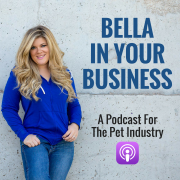 In this episode of “Bella In Your Business,” Bella speaks with Kristie Glazer from Philly Pet Care,a family-owned pet sitting and dog walking company in Philadelphia. 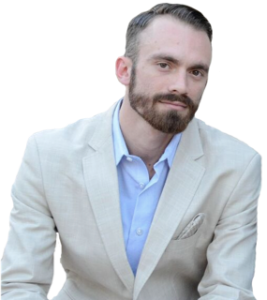 In an unprecedented interview, you learn what it is like when the Zoning Board is knocking on your door telling you to stop your business or they will fine you and board up your home. 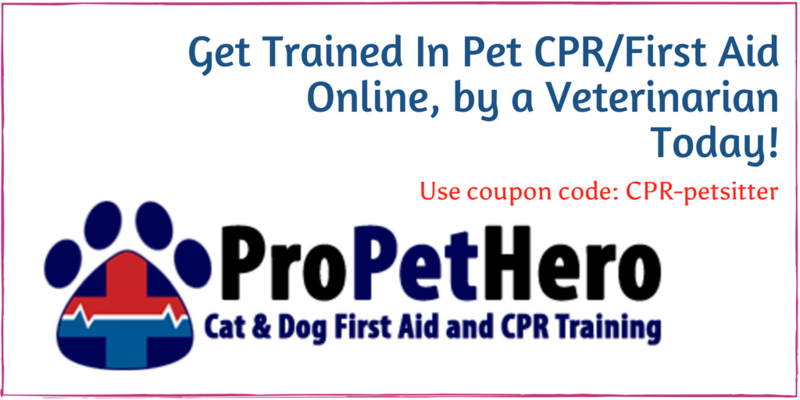 You will also learn how you can take the proper steps in being able to operate your dog boarding business legally in your own home. Kristie talks about the struggles she went through with the boarding aspect of her business and the complicated steps it took to move it from being shut down by the city, to now being the only zoned boarding facility in Philadelphia that is operating out of a private home. 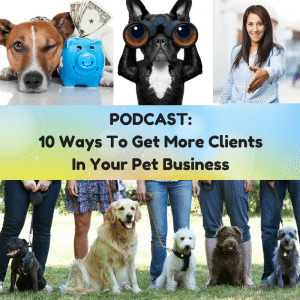 There is great strength and success in this podcast if you are thinking about doing dog boarding in your home. 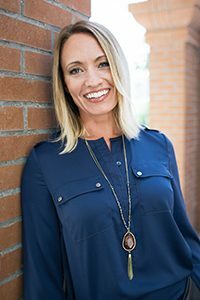 Through a difficult struggle and long process, Kristie was able to get her city to back her business. Unfortunately, Kristie only represents about 1% of in home dog boarders I know about. Many, do not know their city ordinances or know what permit they need to operate legally. Some, choose to ignore and pretend they don’t know they need permits or proper zoning. It is troublesome because some pet sitters use in home dog boarding as their livelihood. If your business is shut down, because you are operating illegally, your income stops. This could have a grave effect on their life. It is a topic to think seriously about and take into proper consideration. 15:42 – Fines or penalties for illegal boarding? 16:36 – Where do people go to start boarding legally? 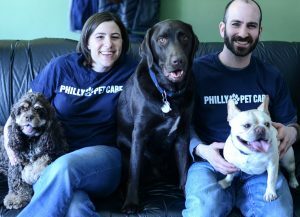 You can find out more about Philly Pet Care and Kristie and her husband Dave athttp://www.MyPhillyPetCare.com. https://jumpconsulting.net/wp-content/uploads/2016/05/bella-pet-sitting-industry-podcast-album-cover.jpg 300 300 ChrisPodcast https://jumpconsulting.net/wp-content/uploads/2018/10/JUMP-CONSULTING-LOGO-2018-2-01-2.png ChrisPodcast2016-11-10 06:45:032018-06-06 13:15:04Episode 23: How Do I Know If It Is Legal To Board Dogs In My Home? In order to get more pet sitting and dog walking clients, Bella notes that people search for many different terms. For instance, she says that if you are dog groomer and you want to groom small dogs or even cats, make sure you list that. Someone looking to get a cat groomed likely won’t search for a dog groomer first. Make sure you are putting all the services you offer, along with descriptions, on your website. Kate notes you should really review your website periodically and make sure what you want out there is very clear. Kate mentions that people often get caught up sharing pet pics, memes and news, but should not forget to put out something everyday about what you do. Images, articles you have written and tips are all good ways to do that. Also, make sure you have filled out all the about sections in Facebook, especially the contact information. Also make sure your banner clearly says what you do. Facebook pages get Googled and so having all of that information in there may actually help you show up more often in Google searches. For those who feel such promotion is too “salesy” Bella recommends you check out “Gary V” (Gary Vaynerchuk ) who has a book called Jab, Jab, Jab, Right Hook: How to tell your story in a noisy social world. He writes that it is about giving value, value, value, and then a sale. Bella says it’s ok to keep sharing valuable items, but don’t forget the “right hook”! Bella says to blog and talk about what you do. Discuss things like “How much does dog grooming cost?”, “Should I get my cat groomed?”, “How do I train my dog?”. She says to take every question people ask you, use the exact question as the title of your blog post, and then answer it. 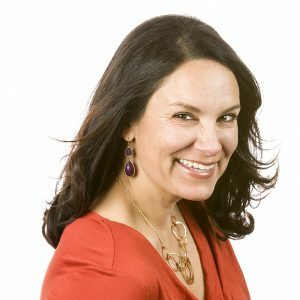 She says it’s not only good for SEO (getting higher placement in Google results), but also gives you an “arsenal” to use when people call with questions. Ask them for their email address and send them the blog post that answers that question. Kate points out that you also need to SHARE your blog post (see tip #2)! And don’t forget to reshare things you wrote months and years ago. Keep sharing it for those who may not have seen it the first time. And revisit them periodically to “tidy” them up and make them more current. Kate suggests that you offer things on your site like free EBooks you create or checklists (like one on things to do before your next vacation), cleaning tips, etc. It doesn’t always have to be about the services you offer, just things that are useful to your customers. When you are out performing mobile services (grooming, pet sitting, dog walking) and you (dog) hear barking at a neighbor’s house, your worker can leave one of these bark cards. Bark cards are small postcards with a picture of a barking dog you get made up that say “BARK, BARK, BARK, BARK, BARK”. On the back leave the top half blank and on the bottom put your branding, list of services, and contact info. In the blank area, take a pen and write something like. “I think I heard a small dog and they were saying ‘Come groom me! Come groom me!’. I was in the neighborhood and if you call me for more information I would like to offer you….” Bella says these cards are shocking and attention grabbing. They also target your demographic. Personalization in key with these cards. Kate said to make better use of the email addresses you have collected through newsletter sign ups, or people opting in to your free downloads. Send information periodically to ensure people remember who you are and what you offer. Bella suggests it could be a “drip campaign” where you have a series of say 5 emails go out over a period of time or it could be a short periodic newsletter. Kate notes that email is important because not everybody is on Facebook or checking out your website, but they may likely be checking email. Bella says a lot of pet business owners just walk into a vet’s office, drop their cards and leave. More than likely the cards get dropped in the trash. So Bella recommends that you build a relationship with the vet’s office manager. People rarely ask the vet about pet sitting or grooming services, but they do ask the front office staff or call in with that kind of question. Kate says that you start a private Facebook group not to sell services but to allow customers and members of the group to get to know you personally. Members get to know each other, build relationships, talk about pets, etc., and build a good community. Start A Dog Walking Club! Bella says that by starting these clubs you will have a micro area of people all interested in the same thing. Do it with your existing customers to build up brand loyalty or expose them to other services you offer. You can encourage them to bring a friend. You could start one at an apartment complex and have the complex promote the club as an activity. Kate suggests you could combine that with the private Facebook group as well. 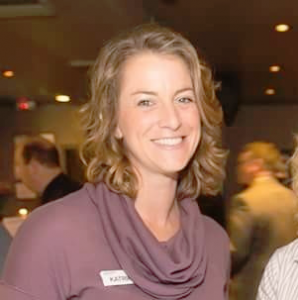 Kate recommends that you create competition events as they are a good way to get new clients. But do it right! Don’t just do a like and share campaign. Really plan it out. 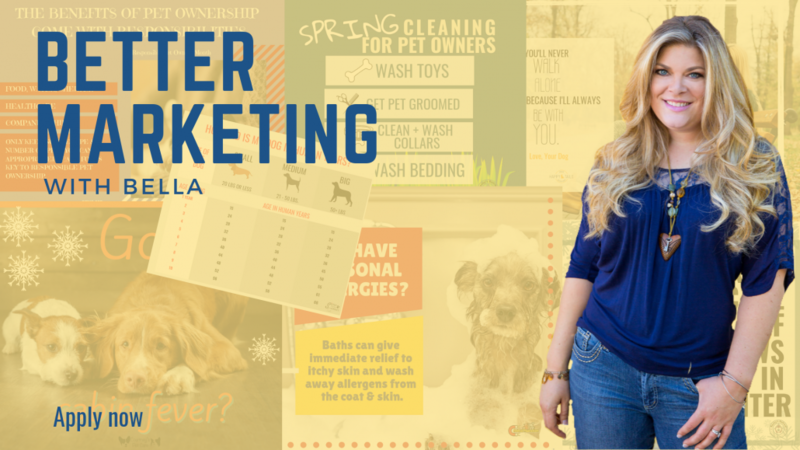 Kate has more information about doing so in her online marketing academy which Bella says is awesome!